Richmond is home to a newly founded passion project, this is the second year of its use at Richmond Regional. Our principal had gone to other schools in Quebec and was intrigued. The Crafts, Board Games and Reading passion is led by Mr. Anderson in the library, students are allowed to switch between the three freely because they’re all in the same room. Students find it a nice break from the stress and work of the school, kids also say its nice because it isn’t just work. One student likes it because they have a chance to do reading for classes during school but not during lunch. Mr. Anderson is usually found at the board games table, he finds it amazing to see students outside of a classroom environment. Mrs. Hill leads the school’s dance passion. You can hear the upbeat pop music from down the hall, but don’t worry, they play more than just pop, all you have to do is ask. There is only one criteria, that it’s clean. Students were dancing their hearts out when I walked in when the song finished. Everyone complimented each other for at least a minute straight. Then the interviews began. Students said that it is a fun way to stay active and an overall good atmosphere. They also said that it’s entertaining. A word of advice from the members is that you have to love dancing and music. Mrs. Barrowman leads Richmond Regional’s badminton passion. Although the gym isn’t complete at the time of writing. Mrs is excited about the gym’s completion so they can finally start. They play tournament style, doubles, singles, and mixed. She was also quick to add that we’re all very cute and are ready to serve some birdies and smash the competition. One student who participated last year said that it’s a great place to make friends and make memories. The movie passion is a double group lead by Mrs. Reid in English and Mme Dube in French ‘’Sit down, watch a movie’’ -Yohan. They watch a wide variety of movies, for example, they’ve watched Love, Simon and Hancock. Students enjoy the club because they get a break from the hustle of school. Spa Passion: Mrs. Smith leads the New and Improved Goddess Spa. Students find it fun and relaxing. They do nails, hair, manicures and pedicures. 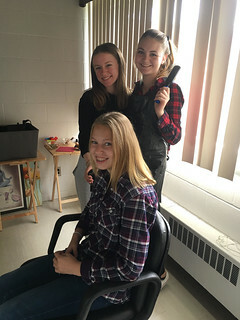 When interviewing a group of students they said, ‘’I like being able to do hair and nails, it’s relaxing and lets us watch the joy on some students faces as they watch it unfold. When Mrs. Smith sat down to be interviewed she said that ‘’I’m a people person, I like seeing students in a different environment.’’ She paused, ‘’4-5 years ago it was a class with actual marks, it lost popularity quickly. Except for this year it’s open to the students.”. You can click on the picture below to view pictures from the 2018-2019 school year’s passions. Richmond Regional is host to many passions and unfortunately, some aren’t on the list at the time of publishing.